While most teens look for prom planning ideas, saving money on prom may be the last thing some high school kids think about when they’re getting ready for prom night, but their families do in fact stress over it. While a super important event for high-schoolers; prom certainly isn’t cheap. According to a 2015 survey by Visa, average high school prom budget for teens in 2015 was about $324. Some families were spending as much as $1000 for prom night! That’s a lot of cash for one night. Add that to the crazy costs of school supplies (although there are many great ways to save money on back to school supplies) and all the expenses teens require and it’s easy to see that many families simply can’t afford to spend that much. Don’t worry though; there are plenty of ways that you can have a great prom, without having to spend a fortune on it. In this post, we cover tips and tricks that you can use to save money on everything, from your outfit to the transportation. So, let’s take a look at some super simple tips & hacks that can keep your prom budget down! In this section, we’re going to discuss tips for saving money on the prom in general. As I explained in our graduation party on a budget post, making a budget, when you are still a student, especially if you have little to no reliable source of income can be crucial now and later on with managing your student debt. Prom is majorly hyped up, so it’s easy to get carried away with the excitement of it all, and impact your bank balance in the process. That’s why it’s important to make a budget. Sit down with your family and outline how much you can afford to spend on prom. Then see how much money you have to allocate to each category. Keep your budget in mind when buying prom stuff, and don’t get carried away. Remember, you don’t have to spend a ton of money to have a great time at prom. Whether it’s transportation, flowers, or your dress or tuxedo, always compare the price of the items and services that you plan to purchase for prom. You’d be surprised by how much prices vary from store to store, even in the same town! And, prices vary just as much online. So take the time to compare prices. Doing this could save you a lot of cash. As with planning and setting a budget, saving up for prom as soon as you can is also important. Put your allowance, a portion of your income from your part-time job, or any money that you receive as a gift towards your prom fund. Then, you’ll have more freedom when it comes to prom season. Need ideas on how to make some extra cash for prom party spending? Check out this list of quick money making ideas. If you’re stretched thinly on the old money front, then consider picking up a side gig. Whether it’s babysitting, pet sitting, tutoring or taking surveys online, there are plenty of things you can do to make a little cash. Check out our post on 27 ways for students to make money quickly here. Leaving everything until the last minute can result in overspending. After all, if you wait until the last minute, you won’t have time to compare prices, and if the prom deadline is approaching, you might make an impulse buy just so you have everything ready in time. Give yourself time to properly plan everything, and getting great deals will be much easier. Whether it’s a can of hairspray or a pair of shoes, whatever it is you’re buying for prom, check to see if there’s a coupon for it. Coupons can save you so much cash! On these websites, you can find printable coupons that you can use to purchase stuff in-store and digital coupons that you can use to buy stuff online. If you’re shopping for prom stuff online, then do it through a cashback website. 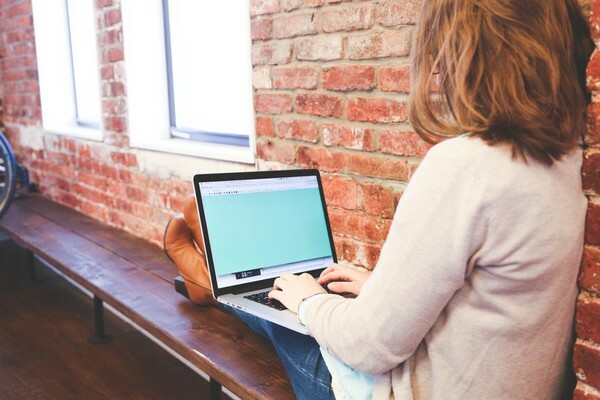 These websites give you a percentage of the money that you spend back – meaning you save money! TJ Maxx, Marshall’s, and Ross, are all great places to find prom dresses, bags, shoes, jewelry, and pretty much everything else you’d need for prom. You can even find low cost makeup, hair care, and skincare products at these off-price stores, so we’d highly recommend a visit! 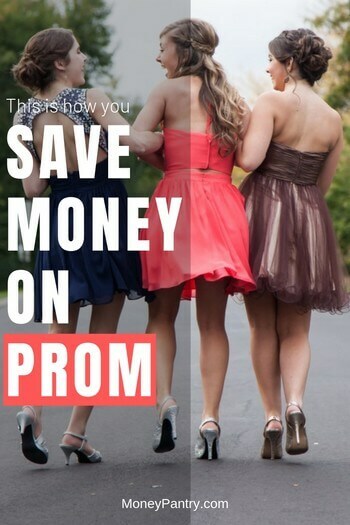 In this section, we’re going to cover tips for saving money on your prom outfit. We’ll let you know how to save money on your prom dress, and how guys can save money on their prom outfits as well (prom budget for guys may be a little different than prom budget for girls, but no body wants to spend more than they have to.). Ask a friend if they have a dress from a previous event that they wouldn’t mind lending to you. It’s a totally new outfit for you – and it’s free. Have a suit that you wore to a family member’s wedding? Or a dress that you wore to a baptism? Perhaps you have a bridesmaid’s dress that you thought you’d never wear again? It’s likely that you already have a formal outfit in your closet – so why not repurpose it. You can easily make it into a new outfit by adding some new accessories. For cheap prom dresses and suits, all the thrift stores near you can be a treasure trove. The thing about thrift stores is that you never know what you’ll find there. Some days there’s nothing that stands out and on others, you can find some real gems. Make visiting local thrift stores a common occurrence in the lead up to prom season. You might come across a beautiful, vintage dress for a bargain price or a pair of shoes in your size to match the suit you already have. So do take a look at your local thrift store for some cheap prom outfits and accessories. And if you are not in a pinch, check out these online thrift stores. You may just find your dream prom dress for cheap. Another place to find a prom dress, suit or tux is at consignment stores. The quality of items at consignment stores tends to be a little higher than what you’d find at the thrift store, as is the price, but you still get a great bargain compared to traditional retailers. That’s the thing – if you go to store that specifically sells prom dresses, then you are likely to pay a premium. If you go to a store that’s not solely selling prom attire, like a thrift store or a consignment store, then you’ll still find the same formal wear, just at a much lower price. Plus, you’re more likely to find something that’s unique. Here’s a list of consignment stores near you. These days, there are so many websites and apps where you can buy and sell stuff including used clothing. And, this clothing is often only gently used. From bags, to purses to tuxes and everything in between, websites and apps really are a great place to checkout for cheap prom-wear. Of course, there are websites like eBay and Craigslist where you can find some bargains. But, do be careful. There are a lot of scams out there. Don’t pay by wire transfer, research the seller, and make sure that you view photos of the piece or see it in person before parting with any money. And, if you do meet with a seller in person make sure that it’s in a public place, that you take someone with you, and that you tell another person about the meeting – give this person the contact number you’ve been using to get in touch with the seller as well. Craigslist and eBay aren’t your only option when it comes to great deals on prom attire. You can also try Poshmark and ThredUp – both of which are easy to use apps where people can buy and sell used clothing and accessories. If you don’t think that you’ll wear the dress again, then renting it could work out cheaper. Of course, you’ll need to do a price comparison to see which one works out cheaper. Check with local bridal shops and other formal wear retailers to see if they offer rentals. If you want to go with the traditional tux for prom, then compare the cost of renting it, to the cost of purchasing it outright. Renting a tux can sometimes work out to be more expensive than just buying it. Again, price comparison is important! If it works out cheaper to buy the tux, rather than renting it, then go with that option – you’ll have a tux you can wear again in the future as well. Check out the places that we mentioned above like Craigslist, eBay, Poshmark, thrift stores and consignment stores to purchase your tux. You can save so much money on prom attire by shopping for it in the off-season. So shop in advance for next years prom – you could even start shopping right after this year’s prom, as many dresses go on clearance! No one will know if your suit is Ralph Lauren or who designed your prom dress. All that matters with your prom outfit is how you look and feel while wearing it. If the outfit looks great and you feel comfortable wearing it, then who cares if it’s not from a brand name designer. Outfits from generic brands are much cheaper and no one will know the difference anyway! Ever seen Pretty in Pink? If you have sewing skills, or know someone who does, then make your own dress. It could work out cheaper! If you need a pair of heels or shoes for prom, then try to buy a pair that you can wear again. When you choose a pair of shoes that you can wear again, you get more out of that initial investment. It’s not just your prom dress that you should consider borrowing. You could ask your mom, grandmother, or other relative if you could borrow a vintage handbag or jewelry. Some organizations, like Becca’s Closet, provide free prom dresses to teens who can’t afford a prom dress. You can visit this page of the Becca’s Closet website to find a chapter near you. Also, you can check to see if there’s a non-profit organization in your area that could help you to get a free or low cost prom dress. Just type in “free prom dress” or “donated prom dress,” followed by your city name or state into a search engine. It’s not just prom dresses that you can get for free. You may also be able to get a donated tux. Just visit Operation Prom and fill out this form. Sometimes it can work out cheaper to make your own jewelry. Check out these DIY prom accessories from Martha Stewart to get started. Also, you could visit your local bead store and make your own jewelry there. From the hairdo to the nails, there’s a lot to think about when it comes to prom. In this section, we’re going to give you tips on how to save money on prom hair and makeup, as well as skincare and nails. You probably have a friend who’s makeup is always impeccable or a family member who’s hair always looks great. Well enlist their help for prom! Ask them if they would do your hair and/or makeup. You can get your hair and nails done at bargain prices at your local beauty school. To find a list of accredited beauty schools near you check out this beauty school directory. YouTube is full of hair, nail and makeup tutorials. You can pretty much find a tutorial on any look you want – whether it’s how to do winged eyeliner or how to contour. Also, you can find tons of nail tutorials on there, as well as tips on things like how to get glowing skin and self-tanning tips. Then, you can use what you learn from these videos to do your own hair, makeup and nails! Use self-tanning lotion instead. You can pick it up for a low price at many grocery stores and drugstores, and online as well. There are lots of tutorials on YouTube on how to self-tan as well. You can purchase a pack of nail stickers at a much lower price than it costs to get a manicure. Plus they look great, but require little effort! Wondering about what vehicle to take to prom? Getting to the prom can be a costly affair. There are a lot of unique and cheap prom transport ideas that will save you money on transportation to the prom. Getting a limo to prom can be pretty costly. So consider renting a nice car instead. It is a lot cheaper! Just check for rental companies that allow 18 year old drivers to rent cars. If you’re going to prom with a large group, then consider renting a van. This is a fun option. But, make sure you have an experienced driver! Another option that’s entirely free, save for the cost of gas, is taking your own car to prom. While unorthodox and not the most exciting option, taking your own car to prom is an easy way to save money. A lot of people have their heart set on a limo for prom – but they’re certainly not cheap. One of the best ways to save money, if you really do want to arrive at prom in a limo, is to share one with other couples. When you split the limo price, then the cost per person is greatly reduced. Prices tend to creep up around prom season, so you can often get a better deal by booking a limo early. Another big part of the prom is the flowers. And, there are plenty of things that you can do to save money on them. Don’t go with the most expensive option – carnations are a good choice, because they are low cost and you can also easily dye them in various colors. 35. Get them from the grocery store instead! This is such an easy tip to follow. Rather than purchasing your flowers from a florist, get them from the grocery store instead. They work out so much cheaper! Of course, there aren’t as wide a range of flowers available, but the amount you save makes it worthwhile. Wildflowers can make for beautiful floral arrangements, and they’re totally free! Going the DIY route where possible is definitely the way to go if you want to save money on prom. And, there are so many great tutorials available online like this one on how to make your own corsage – a quick Google search will generate lots of results. It can be tempting to get a huge bouquet, but it’s also expensive! Opt for a nice posy instead. A small bunch of flowers won’t detract from your outfit, and won’t be a hassle to lug around with you all evening! Prom’s an exciting night, so you want to remember it, meaning photos are important. But, it’s also another cost that can eat into your budget if you let it. So, let’s take a look at a few ways that you can save money on prom photos. If you have a friend or a family member who takes good photos, then ask them to take your prom photos. It’s likely that your photos will look more natural when taken by someone you know – a lot of these professional prom photos can look awkward anyway! If you don’t know someone who’s talented behind the camera, then try asking a photography student from the local university/college. If you do hire a professional photographer, and the photographer uses traditional film, then ask if you can just buy the negatives. Then you can have them printed yourself – this sometimes works out cheaper! If you hire a professional photographer who uses digital film, then ask to buy the files and print the photos yourself at home. Again, this can sometimes be cheaper. 43. Just use your phone! We all carry a camera around in our pocket or purse nowadays, so do away with a photographer and just have your friends snap photos for you, or take them yourself! There are plenty of print on demand companies out there who will print photos from your phone for you at a low cost. Many proms feature a professional photo station where groups of friends and couples can have their photo taken and purchase photo packages. But, with these photos, you can’t usually see the photo that’s taken until you purchase it – and you might think that the photo is terrible! So just take your own photos, as we suggested above. This is a fun way to snap some quick photos of you and your friends at the prom. Disposable cameras are cheap. And, you don’t have to worry about losing an expensive camera or having it stolen! Dining can cost a lot – with many people opting to go to fancy restaurants on prom night. But, like with any other part of prom, there are lots of ways to keep the cost of food and drink down on prom night. This is so much cheaper than eating out at a restaurant. Your parents may even be willing to make dinner for you and your friends (if you ask them nicely enough!). It’s cheaper, and the atmosphere will be much more relaxed than if you went to a stuffy restaurant. Have your friends each bring a dish around to your home, and have a fun, casual, and relaxed dinner. Everyone contributes, making it a cheap alternative to a traditional dinner party or a meal at a restaurant. This is such a fun idea. You may be in formal wear, but who says that you can’t visit a fast food place like Taco Bell or McDonald’s? It’s casual, laid back and you can always say that on prom night you ate at Burger King in a tux or evening gown! 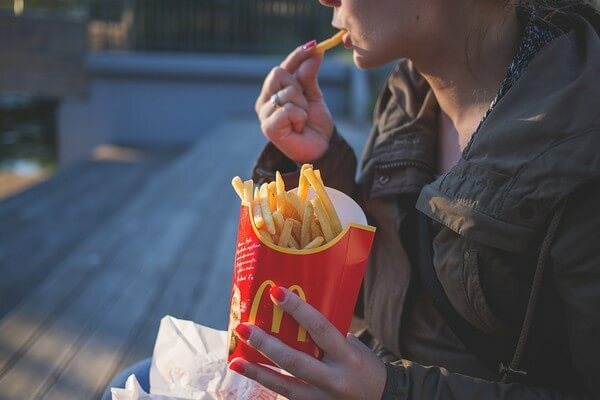 Plus, you can use these fast food hacks to save even more money! Whether it’s at the beach or at your local park, consider having a picnic outdoors with your friends. You can make it a potluck picnic! If you do want to go to a traditional restaurant, then make sure you get a great deal on the meal. Check out Groupon and Living Social – you can often get huge discounts on meals at restaurants near you. So before you choose a restaurant, check to see if you can get a deal that will save you money. Prom doesn’t need to be expensive in order to be fun. Enjoying yourself is what prom night should be about. It’s easy to get caught up in what you’re wearing or the transportation, but prom really should be about having a good time. So follow our tips and have an enjoyable prom without spending too much! And let us know in the comments section below if you have any ways to save money on prom.